The Bell Room within the museum houses the oldest bell in Malta. 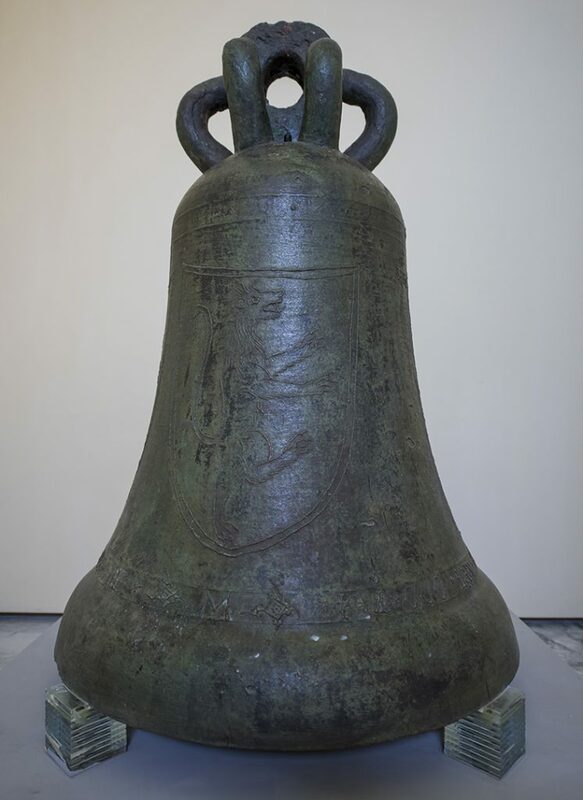 This bell was cast by the Venetian brothers and bell-founders Nicholas and Victor and is the only local medieval campanological specimen dating from the 1370. The bell was lowered from the Cathedral belfry of the old medieval cathedral in 1645 and christened and consecrated Petronilla in honour of St Peter on 7 August by Bishop Miguel Juan Balaguer Camarasa (1635 – 1663). An effigy of St. Paul holding a sword upwards – the sword of victory – is embossed onto the Bell. The remaining sides of Petronilla are adorned with three armorial shields depicting a rampant lion, possibly manifesting the symbol of St Mark the Evangelist, Patron Saint of Venice were the bell was cast. The lower waist above the sound bow of the bell is adorned with an inscription in decorative Gothic font stating the year of casting, the names of the founder brothers and the matrix city. Following the earthquake of 1693, the old medieval cathedral suffered substantial damage and had to be rebuilt by Lorenzo Gafà in the Baroque style between 1697 and 1703. It is in fact one of the few mementos from the old cathedral to survive. The bell was reinstalled into the belfry tower of the baroque Cathedral and remained there until 2008, when it was removed to be restored and placed within the museum. The decision to remove the bell from the belfry was taken on the basis that it is an extremely rare example of medieval campanological art worldwide. Apart from the fact that continued use could possibly risk cracking it, rendering the bell toneless in the process. The bell’s musical timbre is typically medieval and gives one an impression of what bell sounds were like in this period. In this respect the bell did not musically complement the other Cathedral bells, cast much later, since by then bell founding had produced a completely different bell profile and an overall different musical timbre. Weighing over a tonne, the bell was lowered from the belfry in a very delicate and complicated operation planned more than a year before. Its vacated arch in the belfry has now been occupied by the Cathedral’s treble bell, Publia, cast in 1958. Petronilla was placed in the Cathedral vestry and was treated on site by campanologist Kenneth Cauchi in an arduous job that involved the removal of three coatings of paint that had been applied in error to the crown of the bell some years back. Other conservation treatment work consisted in the removal of various corrosion products, and rust stains. Corrosion inhibitors and protective coatings to conserve the malachite noble bronze patina were applied to the surface of the bell after cleaning. Once the restoration was complete the bell was transferred to the bell room in the Mdina Metropolitan Cathedral Museum. Visitors to the museum can hear the sound of Petronilla which has been digitally recorded and stored for posterity.